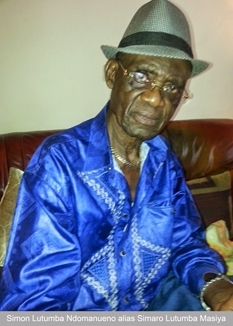 Reports emanating from Kinshasa suggest that legendary Congolese composer/guitarist Lutumba Simaro is seriously contemplating retiring from the music scene. Simaro, whose full name is Ltumba Massiya Simaro Ndomanueno was born in 1938 and has been in the music scene since the early 1960s. He recently celebrated his 77th birthday on March 19 but has been beset by health issues. In December of last year, he was admitted to a hospital in France. He stayed in France for 3 months undergoing treatment. The Congolese Government through the Minister of Culture and the Arts and of Public Health has been footing his medical bills. His latest album “Ma Priere” ( “My Prayer”) contains a total of six tracks: “Ma Priere,” “Papa Yav”, “Maria Victoria”, “Toto”, “Laurette In Memoriam” and “Okozua wapi”. The band finished mastering, this album which saw the participation of by Lutumba Simaro as composer and director as well as vocalist, Malage Lugendo singer who sung in two songs, and appears in the videos. This entry was posted in Africa Music News and tagged Africa music news, lutumba simaro. Bookmark the permalink.